Andrew J. 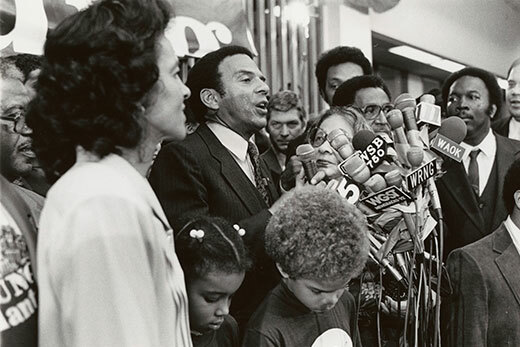 Young, the night he was elected mayor of Atlanta, Oct. 27, 1981. Ron Sherman photographs, Manuscript, Archives, and Rare Book Library, Emory University. 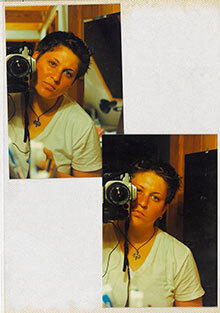 Alli Royce Soble and camera, 1997. Alli Royce Soble photograph albums, Manuscript, Archives, and Rare Book Library, Emory University. The Manuscript, Archives, and Rare Book Library (MARBL) at Emory University recently acquired three photograph collections that will enhance its archives of the arts and art history, Atlanta and Southern history, and the LGBT community. Photo albums from photographer and artist Alli Royce Soble that document Atlanta’s LGBT community and arts scene in the 1990s. Born in Florence, Italy, Niccolini is widely regarded as one of the pioneering women to photograph the male body and male nudes, and her photographs predate the work of Robert Mapplethorpe. Niccolini’s family left Italy after World War II and immigrated to America. She moved to New York City in 1955 to study art but decided to pursue photography after she met Weegee – Arthur Fellig – the famous street photographer in 1960. Unable to find work in the male-dominated field, Niccolini worked as a medical photographer in several local hospitals. Because of her day job photographing surgeries and diseased bodies, she was drawn to making pictures of what she called “healthy bodies” in her art photography, Gue says. She published “Men in Focus,” a book about women looking at men, in 1982 and edited “Women of Vision: Photographic Statements of 20 Women Photographers” the same year. As a result of the discrimination she encountered, Niccolini helped found Professional Women Photographers, an organization designed to support and promote women in the profession. The collection consists of Niccolini’s photographs, negatives and slides, examples of her paintings and other artwork, subject files related to “Men in Focus” and printed material regarding her exhibitions and speaking engagements. Sherman arrived in Atlanta in 1971 and began photographing life in the city and the state on assignment for Life magazine, Newsweek, The New York Times, Sports Illustrated, Time and The Washington Post. He also sent his work to his agency in New York City so it could be licensed to other publications, but when the agency closed, all his prints were sent back to him, Gue says. The collection consists of 750 vintage silver gelatin prints documenting Southern politics, business and culture. It features photographs of Atlanta’s changing built environment, political figures like Jimmy Carter, Maynard Jackson, Andrew Young and George Wallace and iconic photos of Hank Aaron’s record-breaking 715th home run. Gue says Sherman’s photos dovetail with MARBL collections such as the Newsweek Atlanta bureau records, Robert W. Woodruff papers, and many other collections. The collection consists of 24 albums that document LGBT life including drag shows, fashion shows, parties and other events at places such as My Sister’s Room and The Tower, as well as Atlanta Pride celebrations, an LGBT March on Washington, Atlanta’s 1996 Olympic Torch events and other happenings. Soble has annotated the albums, providing captions for most of the photos. All three collections, although unprocessed, are available to researchers. A preliminary inventory of each collection can be found in the related links section.